A "friend" has been looking to start his first real coding project and dungeon runners has always been in the back of his mind. Because of the nature of the project i'll handle the public side of things. He spent the past few days seeing if it was doable. It took a while longer than he had hoped, he's learning as he goes, but doable it is. The packet format and encryption have been uncovered as far as logging in goes, and that should be the hardest part out of the way. Next thing that we need is to know how many people are still interested? Last edited by Maxammus on Fri Aug 29, 2014 12:53 am, edited 1 time in total. Awesome! I can't even tell you how glad I am someone's still interested! I'll be looking out for more info! I'd love to see more people getting interested in this as well! I'm sure there would be a ton of players interested in this! Once it's functional, a hundred players within the first 2 weeks is definitely doable. I'd love to get updated on this! 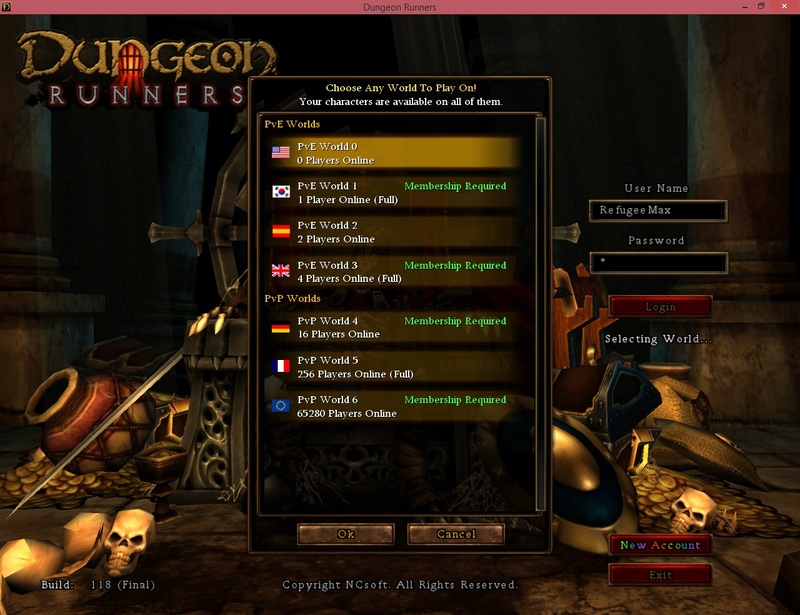 In case this is not a fake, I can tell you there are tons of people interested in this, I myself, know at least 20 people and overall dungeon runners had a small but VERY dedicated fanbase, I can 100% assure you that people will play this if it's possible. Definitely keep us updated on this, PLEASE. I think so about DR so much, it simply was the best arpg of all time. Just point me in the direction of Townston and I'll be there. Cant explain how good this seems, please keep this updated, would be fantastic, really....! Don't know how or why someone would fake this haha. We're glad to see people are still interested. He'll be putting what time he can afford to into the project. The next step is figuring out what data the client's sending the server as it logs in, which he's about halfway through. It's slow work (Getting to server select took about 40 hours) and there won't be much to show off for a while but it will steadily get done. Utterly utterly interested, not sure where the heck in my wizard's tower attic the original game disk is, but I will donate, buy, rent, lease, extort my way back to DR if I must. Count me in! EXTREMELY interested in this! I've been fiddling with hosting servers myself that maybe a friend and I could connect to, but I've had no luck myself atm. But, I can definitely see you're ahead since you already have a server that you could select (and possibly connect and play on as well). Besides my experiences with this, I am really excited to hear some news on this wonderful peoject you got going here! Even though I'm new on here account wise, I still played back when DR was live, and I have checked in here sometimes to see what people were up to but had never made an account until today (Thanks again Darth for the help!). Really for the past week since I've seen this I've been getting more and more interested in helping in the making of a server emu for the game! Do I know much about server emu's? : not besides the fact I know what they are and what purpose they serve BUT I am willing to assist in any possible shape or form: whether it be with money, advertising, promoting, etc. I will at least try to help bring back the game that a large number of us had played and enjoyed. Now more than likely nobody here remembers me (ArchKnight) since I hardly ever talked, and when I did, I was begging for rb's and other free junk since I was a HUGE noob back in the day. But anyhow: I want to just conclude with saying thank you for starting to create servers for us Dungeon Runners Refugees who want to play this amazing game again, and I have faith in this towards it being VERY successful. Keep up the great work, and keep us updated PLEASE! Very Interesting. I am incredibly delighted that so many of you still love this game and I'll help in any way I can. I apologise that it took so long for me to reply, my e-mail was being buggy from the "security rubbish". Update time! It took longer than expected to find where the client gets each piece of the message from. He switched to a new tool which should make things easier but there are a lot of ins and outs to learn. As for the progress, we're back to the server select screen but now know what (almost) every bit of information means along the way. Next in line should be character creation and actual play hopefully not too far behind that. If anyone would like to donate, for now i think we'll handle it through my maxammuszeluco@gmail paypal. Any donations would obviously be greatly appreciated and go directly to allowing more time to work on this. It's a bit cumbersome and unclear re-describing things so from now on i'll just be quoting everything directly. It takes time to reach any milestones but I don't like going weeks without saying anything. I'll try to find a balance between significant updates and letting you guys know what's going on. Hopefully some of the next goals will be more straightforward. Figuring out multiple systems and encryptions for just logging in is taking its time where gameplay should mostly be a few functions where different spells and actions are just a handful of changing numbers. I haven't gotten to character creation yet but it should be very close. Connecting to the next server uses a system that cycles through a few states to process packets and I've mostly figured it out. One of the states needs the message to use a certain compression so I redesigned my server code to handle things like that. It all works without any errors but now it's looping in the second to last state. I know which variable needs to change to move on but not where it changes, which is what I'll be working on next. No worries! An update/announcement every month is fine no matter how brief it may be! Just knowing that you're keeping up with the project is definitely enough to keep me tuned in. But anyhow, keep up the amazing work man!